Truly great universities innovate and evolve to reflect the necessities of students and society. New knowledge is created bringing about new majors and fields of study. Syllabi change. New courses are added. Pedagogy progresses. Technology advances. And, ultimately, curricula transform. While some of these alter at a yearly pace, other changes are measured in decades. The general education requirements at William & Mary were last reviewed two decades ago and make up approximately 25 percent of degree requirements. The recent review of the general education curriculum was timely and in line with standard practices at universities. The W&M education I received was grounded in the needs of my generation. For present and future generations, the challenges are vastly different. What remains the same is the need for the quality liberal arts education that William & Mary has always provided. The strategic planning effort that President Taylor Reveley initiated when he came into office in 2008 identified a need to look at our undergraduate curriculum. In particular, the plan noted opportunities to take advantage of William & Mary’s strengths in interdisciplinary study, internationalization and student research. After a long process of deliberation and refinement, the Faculty of Arts and Sciences voted last December in favor of new general education requirements that will go into effect in the fall of 2015. We asked Provost Michael R. Halleran to answer some questions about the new curriculum and how it helps position William & Mary as a leading liberal arts university. The curriculum changes apply just to the general education requirements. Just what is the general education curriculum? Through the undergraduate general education requirements all students explore different areas of knowledge, giving them a breadth of understanding. In addition to these general education courses, students take a major to explore a field in depth and electives to round out their studies to suit their individual interests and plans. General education courses make up about 30 of the 120 credits required for the bachelor’s degree, or about 25 percent of the total. This total number of credits in general education remains roughly unchanged in the new curriculum; I say roughly because the precise number will depend on exactly which courses are chosen to meet the requirements. The new curriculum has been described as the College Curriculum, or COLL. What does that mean? The new curriculum makes changes only in the general education component, that is, about 10 courses. Of these 10 courses, seven will be College Curriculum (COLL) courses specifically designed to introduce students to the liberal arts. The courses will stress writing skills, interdisciplinary perspectives on important issues, global studies and a research experience. The other three courses that make up the general education requirement will require students to select courses from three broad areas of study that might generally be described as the arts and humanities, social sciences, and the natural sciences. The main innovation lies in the development of COLL courses specifically developed by W&M faculty to provide an outstanding introduction to the liberal arts. What are the goals of the new College Curriculum? The new curriculum responds to William & Mary’s strategic plan’s focus on being one of the world’s leading liberal arts universities and providing the very best undergraduate education. The plan highlighted W&M’s exceptional engaged learning, the close interaction among students and professors exploring ideas through rigorous inquiry including real studentfaculty research, while also noting W&M’s potential to expand in interdisciplinary and global studies. The new general education curriculum emphasizes these strengths. It also puts increased emphasis on the development of communication skills in the first year of study. What are the key differences of the COLL system versus the current General Education Requirements (GERs)? The current General Education Requirements, or GERs, require students to complete coursework in seven specified areas as well as demonstrate several proficiencies. Students can, and most do, fulfill some (even many) GERs before arriving on campus. The average freshman now enrolls having earned 16 credits, roughly one semester’s worth. Unlike the current GER system, all COLL courses will all be taken at W&M. They will be true college-level, intellectually demanding W&M courses designed and taught by W&M faculty. Every incoming student will take, in addition to a freshman seminar, a 100-level course focused on big ideas that frame how we view the world. Both courses will challenge them to think critically and creatively, while also developing communication skills. Every student will also take at least one course grounded in each of the three broad knowledge domains, and each of these courses will intentionally integrate concepts across disciplinary boundaries. Every student will expand his or her global understanding, ideally by studying abroad (our goal is for 60 percent of all undergraduates to do so) or through newly designed 300level courses taught on campus. Every student will have a “capstone” experience, most typically in the major during their senior year. This will serve as a culminating course in the liberal arts and will bring together critical thinking, problem solving, scholarship, and communication skills. This can be satisfied through upper-level seminars, independent study and research projects, and Honors projects, as deemed appropriate by departments, programs or schools. Do students have flexibility to graduate early with COLL? Yes. While the new curriculum framework envisions COLL courses spread over a student’s entire academic career at W&M, there is no mandate on timing. The only requirement is that students take two College Curriculum courses, COLL 100 and COLL 150, in their first year. Both provide a necessary foundation to the liberal arts. In reality, a student could finish in three years, even if currently only few of our students elect to do so. Will students still receive credit for Advanced Placement (AP)/International Baccalaureate (IB) courses? Yes. W&M students can continue to apply credit earned through AP and IB courses towards the 120 total credits required for a bachelor’s degree. But the COLL system ensures that a W&M graduate will, in fact, complete the majority of the general requirements here at W&M. The practical result will be that AP/IB credits will continue to count towards other parts of W&M general education, electives and, in some cases, the major. When will the COLL curriculum be implemented? We will pilot new general education College Curriculum courses in fall 2014 and fully launch the curriculum with the fall 2015 freshman class. The new general education curriculum will be introduced in stages over four years, with each succeeding year in place as the initial class of students moves toward the senior year. Can you explain the process the committee used to develop the College Curriculum? In autumn 2010, I wrote a memo to the three deans with a purview over undergraduate education (Arts & Sciences, Business and Education) asking them, with Arts & Sciences in the lead, to take up with their faculties the promised review of the curriculum, setting broad parameters for their exploration and encouraging them to be expansive in their thinking; after 20 years, changes at the margins seemed inadequate. Over a two-year period, the Curriculum Review Steering Committee, comprising broadly representative faculty and a student member, through frequent meetings, focus groups and more public fora, studied, discussed and developed a plan. After approving a set of guiding principles for the curriculum, the faculty, over an additional year, considered, debated, modified and ultimately voted to adopt the individual elements and then the overall package of the curriculum. Will the College Curriculum uphold the rigorous standards of a W&M education? Absolutely. If anything, the interdisciplinary nature of the COLL curriculum should demand more and deeper thinking by our students. Rigor is the result of professors and students of the highest quality demanding academic excellence from one another in every course without exception; it is not confined to specific courses in prescribed areas. Rigor has been a hallmark of a W&M education for centuries, and it will continue to be. How will the new curriculum enhance faculty advising and student support? ing College Fellows. The first cohort of four W&M faculty members began work in January. Each Fellow will design and teach a new COLL course and assist their colleagues in developing their own general education courses. The Fellows will also play a role in determining how best to provide academic support to students outside the classroom. Will the College Curriculum cost more? There will be some development and transition costs as faculty design and implement the new courses, and some investment in expanding the engaged learning model that characterizes a W&M education. When fully implemented in 2019, we expect annual costs of the new curriculum to be approximately an additional $700,000, mostly to fund increased research opportunities and the capstone experiences for all our undergraduates. While the costs are not trivial, they are modest when you consider the College’s overall academic budget is $160 million, and they constitute an important investment in the quality of undergraduate education. What will be the College Curriculum’s effect on job prospects for students? The COLL Curriculum will be one important part of a student’s W&M education. W&M students will also continue to take a major (and often a minor), along with electives. Collectively, this combination of breadth, depth and integration will provide excellent preparation for graduate and professional schools and for careers of all kinds. Overall, our goal is to provide students with the knowledge and skills that shape independent thinkers, engaged in the world around them and prepared to assume leadership roles in their chosen fields. What else would you like alumni to know about the new College Curriculum? First, as noted above, we are very early in the implementation process. There is still more work to do, especially in the area of designing the rigorous courses that embrace this integrative and innovative approach. Second, our faculty are among the finest teachers and scholars in the world; they will make sure that our students receive the very best liberal arts education available. I am fully confident that the College Curriculum, when fully implemented, will be a national model for the liberal arts. 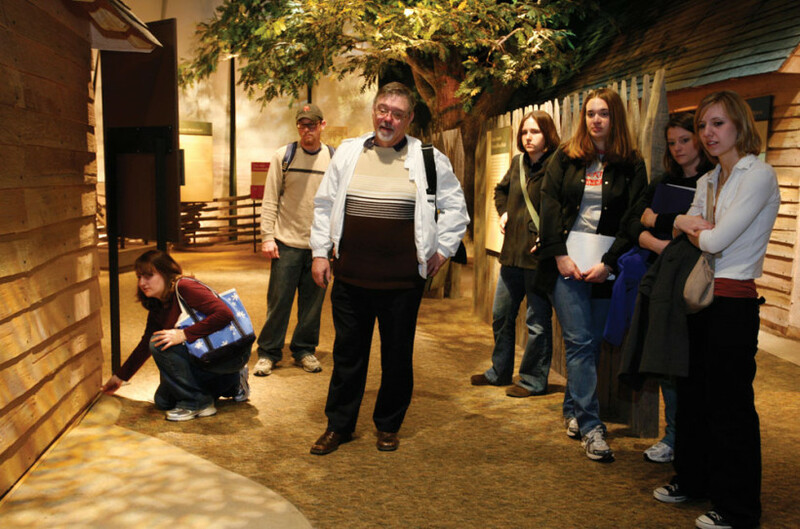 Jim Whittenburg, Pullen Professor of History, often brings students to the Jamestown Set- tlement as part of his course, “From the Founding of Jamestown through the American Rev- olution,” which is offered as a history elective, shown here, and as a Freshman Seminar that combines explorations of museums, archaeological excavations, and historic places with critical reading of literature on early America, weekly writing assignments and lengthy course discussions. The new College Curriculum approved by faculty retains the current Freshman Seminar as COLL 150. The first-year seminar course strengthens written and oral communication through in-depth study of a specific topic. COLL courses will arise out of every academic field and disci- pline. Ten courses (approximately 30 of the 120 credits needed to graduate) are required in the College Curriculum. The remaining credits are taken as electives and in the major. COLL 100 introduces students to William & Mary’s academic resources and rigor. Required of each freshman, these courses will focus on communication skills. COLL 150 retains the current Freshman Seminar in the new curriculum. The first-year seminar course strengthens writ- ten and oral communication through in-depth study of a spe- cific topic. COLL 200 deepens a student’s understanding of a specific topic and the broader framework of the liberal arts. For exam- ple, instead of taking a course on Greek tragedy, a student might study fifth-century Athens through art, religion, anthro- pology and literature. Typically taken during sophomore and junior years, one COLL 200 is required in each of three knowl- edge domains: The Natural World and Quantitative Reasoning (Natural Sciences); Arts, Letters, and Values (Humanities); and Cultures, Societies, and the Individual (Social Sciences). COLL 300 asks students to engage the world beyond cam- pus. This may include study abroad or another off-campus academic experience, such as a W&M D.C. program focused on global issues. For other students, a colloquium course will bring the world to campus. COLL 400 provides students with a culminating experience through upper-level seminars or capstone courses offered in the majors, or a departmental honors thesis. College Curriculum Electives are designated by depart- ments and programs as belonging to one (or more) of the three knowledge domains. Students take at least one course in each domain. Proficiencies are required in a foreign language and in quanti- tative skills and can be satisfied by pre-matriculation credits. Other proficiencies (e.g., writing, digital literacy) are built into COLL courses. AP/IB cannot be used for COLL credits but will continue to count towards the 120 credits to graduate. Students may use AP/IB credits in all elective courses, including the three in the required knowledge areas, for some courses in the major (varies by major) and to satisfy proficiencies.